Ripple XRP/USD are trading at 0.3261 and continue to move as part of the correction. Cryptocurrency capitalization at the time of the publication of the forecast is $13 569 699 604. Moving averages indicate a downward trend in Ripple. 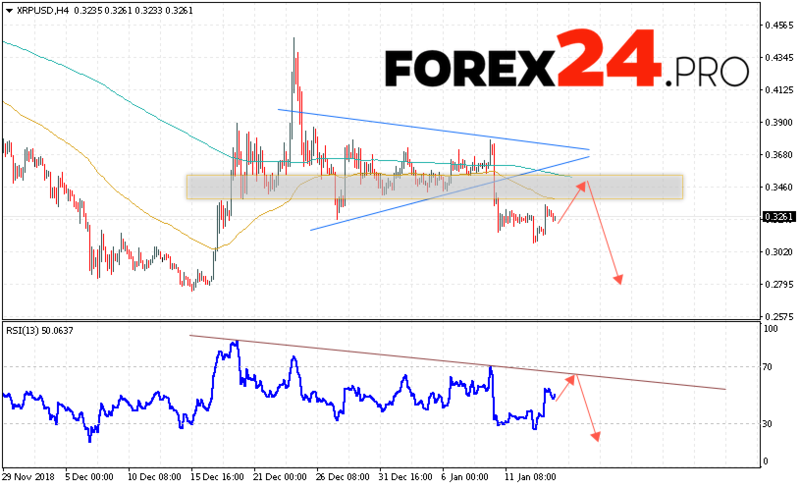 At the moment, we should expect an attempt to grow and test the resistance level near the area of ​​0.3450. Further, the continuation of the fall of cryptocurrency in the region below the level of 0.2795. In favor of falling XRP/USD quotes, a test of the downward trend line on the relative strength index (RSI) will come out. Cancellation of the option to reduce cryptocurrency will be a strong growth and closing of quotes above the level of 0.3680. This will indicate a breakdown of the resistance level and continued growth of XRP/USD to the area above the level of 0.4200. With the breakdown of the support area and the closure below 0.3055, we should expect confirmation of the development of a decline in Ripple. Ripple Forecast and XRP/USD Analysis January 16, 2019 involves an attempt to test the resistance level near the 0.3450 area. Where can we expect the continuation of the fall of cryptocurrency with a potential target at the level of 0.2795. An additional signal in favor of reducing Ripple will be a test of the trend line on the relative strength index (RSI). Cancellation of the option of falling quotes will be a strong growth and the breakdown of the 0.3680 area. In this case, we should expect the continuation of the downward trend in digital currency.